Babblings of a Mommy: It's Time To Shop Spring With Target. It's Time To Shop Spring With Target. Spring is knocking on our doorstep which means I’m spending my spare time polishing up on my Spring Wish List. After this brutally cold winter, I’m ready for some warm weather essentials. The problem is that after a whole season of heavy knits and chunky sweaters - I need a little inspiration to get my style juices going. My solution is to scope out fashion magazines, Pinterest, and other style blogs for some much needed visual aids. I also pay close attention to the season’s top trends and go to retailers like Target who offer great seasonal style at attainable prices. In fact, Target has made it extremely easy to shop their products this spring with an interactive shoppable video! It makes it super easy for people like me who like to see how a product is styled and buy it right then and there! Some key pieces I’m loving right now are the Merona Twist Waist Dress, the Mossimo dip-dyed shorts, and what spring list would be complete without super cute wedges like the Merona Emilia Espadrille. 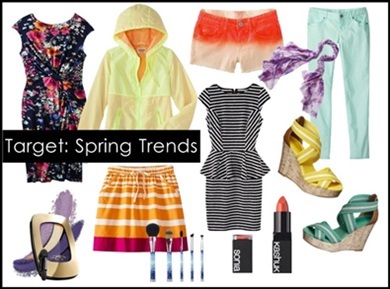 The video also features this season’s hottest trends – florals, fluorescent brights, pastels, and stripes! Can you feel it now? No - I had no idea! I'm sending you an email now. Thx!! Target has some fly clothes every season! I am so there!